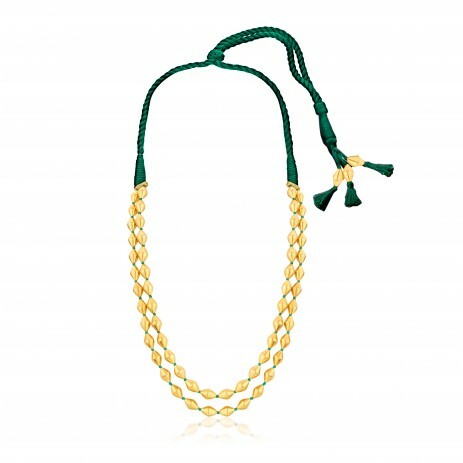 Double strand of gold plated Sterling Silver dholki shaped beads strung together in adjustable green cord. While this necklace meets our quality standards ,it comes without Hallmarking as the Hallmarking process involves the application of a strong force to engrave on the metal, and the dholki beads may get disfigured, due to their intricate craftsmanship. Mounted in 92.5 Sterling Silver and plated with 24 Karat Gold. Maximum Length: 21 inch Minimum Length: 10 inch Note: Silver beads are wax filled. These beads are handcrafted and due to their fragile nature minor chipping, dents and spots may occur, which should not be considered as a defect in the product.